I’m doing some research on Hughes’ trip to West Africa, which is often considered a formative moment for Hughes’ politics and understanding of race. As a visual thinker, I was having trouble keeping track of exactly where Hughes went while employed as a mess boy on the West Hesseltine, a cargo and passenger ship. 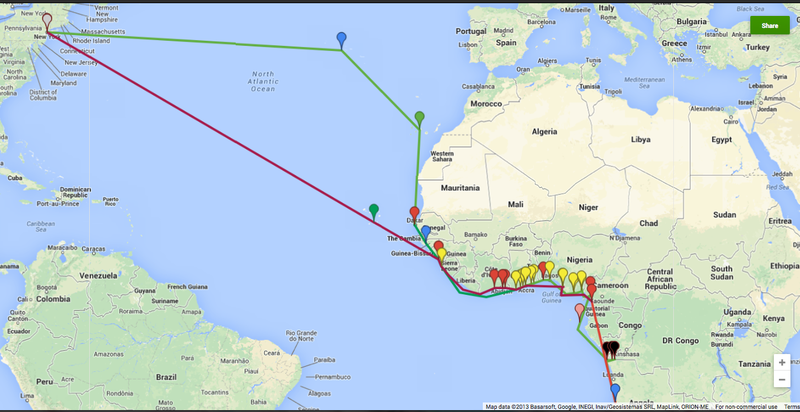 Using the ports and dates that Arnold Rampersand gives in his biography of Hughes, I plotted out the points on Google maps. 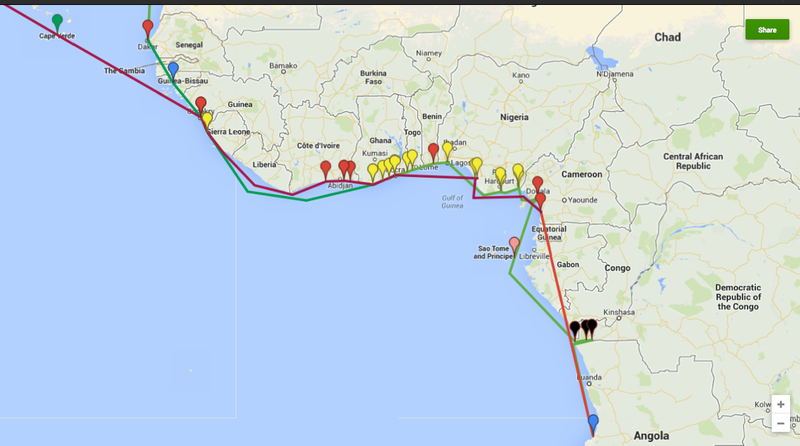 The green lines show the voyage out, and the red lines show the return trip. The pin colors show the imperial power that controlled the ports he passed through. Portuguese territories are marked with blue pins, Spanish with green, French with red, British with yellow, and Belgian with black. I may have made an error here or there, but I thought it was interesting and worth sharing. Click here to view the map in Google. Looking at this map, one thing that stands out to me is the impressive cross section of colonialism that Hughes encountered. He passed through the colonial territories of no fewer than five empires–British, French, Portuguese, Spanish, and Belgian–an experience that opened his eyes to the violence and exploitation of colonialism. Describing his first impressions of Africa in his autobiography, Hughes recalls “A long, sandy coast-line, gleaming in the sun. Palm trees sky-tall. Rivers darkening the sea’s edge with the loam of their deltas. People, black and beautiful as the night. The bare, pointed breasts of women in the market places. The rippling muscles of men loading palm oil and cocoa beans and mahogany on ships from the white man’s world, for that was why our ship was there–to carry away the treasures of Africa. We brought machinery and tools, canned goods, and Hollywood films. We took away riches out of the earth, loaded by human hands” (101-102). Note: This is part two of a mini-series on classroom experiments I’ve done in the spirit of Do-Nothing Teaching. You can read part one here. Read about Do-Nothing Teaching here and here. In my second year of graduate teaching, I taught a remedial writing version of W131, IU’s freshman writing course, that is intended to help struggling and under-prepared writers develop the skills for writing at the college level. While most of our time was spent covering the basics of the genre—thesis statements, paragraphing, working with sources—a significant chunk of the syllabus was devoted to reading and discussing non-fiction essays. My spring semester class struggled with in-class discussion. Their reading comprehension was good enough, but they weren’t able to talk about the essays. Many of the students in my 15 person class wouldn’t speak at all. Even calling our classroom talk “discussion” is a stretch. Instead, we evolved into scripted question and answer sessions that felt more like call and response than conversation. Part of the problem was that my students were unused to this sort of liberal arts education. Most of them simply hadn’t been called on to engage with a text in this way before. High school tested them on content, not application. But another part of the problem was with me; as a relatively new teacher, I responded to their silences by writing ever more detailed lesson plans. In a Socratic spirit, I never lectured, but the series of leading questions I ended up writing might as well have been a lecture. They certainly contributed to the call-and-response style discussion that left me and my students feeling disinterested and disengaged. While teaching this class, I happened to also be in a graduate seminar with Johnathan Elmer, a gifted teacher in IU’s English Department. One day, Johnathan announced that he was going to do an experiment. There were two rules to this experiment: everyone, including Johnathan, had to speak at least once. People could speak in any order, but after speaking, you couldn’t speak again until everyone else had said something. Though I wasn’t sure that his graduate seminar strategy would work in my remedial writing class, I was sure that whatever happened would be better than another tooth-pulling Q&A discussion. So when the next essay day came around, I wrote down three questions that I hoped we would hit, I explained the two rules to my class, made sure they understood and were willing to play along, and then I sat down and shut my mouth. Not an auspicious start, but what could I do? Rather than break my own rules, I shrugged my shoulders and gestured at the class to carry on. My back started to sweat, but I counted to ten and kept looking at them expectantly. “Just keep smiling,” I thought. Eventually a student spoke up, then another. There were awkward silences, for sure, but we made it through everyone in under fifteen minutes. I wrote down everything they said on the chalkboard, and when we had gotten through everyone I asked some follow up questions that helped us synthesize their various questions and observations. At this point, I’d like to say that every discussion we had afterwards was amazing. They weren’t. Sometimes they still felt forced. But this discussion experiment did mark a change in the class. My students were quicker to engage, they asked more questions, and they made more connections to things outside of the classroom. Most importantly, though, they started asking each other questions. I didn’t expect this outcome, but a nice development in our discussions was that they started addressing each other directly, asking their peers to clarify or expand their points. Removing my voice, temporarily, forced them to fill the void with their own input, and though they might not have mastered it, I think they started learning how to learn from discussion. The core of Do-Nothing Teaching, as Kevin explained it, is the idea that, sometimes, doing nothing is the best thing a teacher can do to encourage students to learn. As I understand it, in this context “nothing” doesn’t mean showing up to teach with no lesson plan. It is not double-talk for “lazy teaching.” Instead, it means something more like continually reflecting on your teaching practice in order to remove anything from your classroom practice that is hindering student learning. You can read more about the foundations of DNT here and read Kevin’s recent thoughts at his blog. DNT resonates with me on a couple of levels. Teaching is often thought about in additive terms, which means that our conceptions of both teaching and learning are shot through with the language of accumulation. Teachers give knowledge, feedback, grades, and students acquire skills, insight, and grades. Now, I happen to think that this process works pretty well, overall. Teachers do have a lot to give, and students do benefit from the accumulation of knowledge and skills they gain in college. So, in addition to accumulation, I think we also need to devote time to reflective practice, and this is why DNT really appeals to me; DNT emphasizes reflective practice reflection for both teachers and students. I think this is something that most teachers do already, though they might not articulate it in these terms. Whether we ask students to consider the cultural implications of Toni Morrison’s Beloved in class discussion or to craft an unobvious thesis statement, we are creating situations in which what matters most for student learning is an empty space where students can reflect, experiment, and play with their own ideas. Though the language of Do-Nothing Teaching is new to me, speaking with Kevin made me realize that I’ve experimented with this approach for years in my writing and literature classes. I’m going to describe a couple of these experiments in the coming weeks. In the meantime, I’d ask you to check out Kevin’s work and think about experimenting with removing a normal part of your teaching for a day or two to see if it changes how (or how much) your students learn.